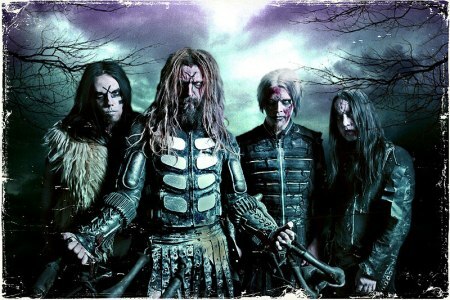 So last week, I was fortunate enough to find myself in possession of a ticket to see the return of Rob Zombie to the UK. I’d kinda lost touch with what he’d been doing over the past few years musically, (I have Halloween 2 on the planner to watch!) but given that he’d likely be churning out a few solo tracks from ‘Hellbilly Deluxe’ and ‘The Sinister Urge’ and, fingers crossed, a few White Zombie numbers, I was pretty hyped for the show. I ordered the deluxe version of Hellbilly Deluxe 2 but it didn’t arrive til the day of the gig, so I did all my prep on the way there in the car in the way to Manchester. It’s a pretty good album. Not a patch on the first Hellbilly album but it has some classic Rob Zombie sounding tunes on it like ‘Mars Needs Women’ and ‘Sick Bubblegum’. Unfortunately, my copy of ‘Educated Horses arrived the day after. No homework for that! Anyway, the gig was ace. First up were Revoker. To be honest, they didn’t do a lot for me. Spent more time Tweeting and updating my Facebook profile while they were on, so I waited it out knowing Skindred were up next. Sorry guys, just not my cup of tea! I love Skindred. They’re a really unique sounding band. Good riffs, catchy choruses and great sing-along moments. It always helps a band when they have a frontman the calibre of Benji Webbe to add to the fantastic music. Anyway, they blazed through a decent set of tunes including ‘Trouble’, ’Nobody’, ‘Pressure’, ‘Destroy the Dancefloor’ and ‘Stand for Something’ and improved the night no end! …and then for the main event. Rob Zombie. Not been over for 13 years and it was probably that tour I saw him last too! His live band now consisting of himself, Piggy D on bass, Murderdolls/Slipknot man Joey Jordison on drums and ex-Marilyn Manson man John 5 on guitar. It was quite a show, and something a lot of bands should pay attention to. If you’re gonna make a spectacle of your live show with gimmicks, do it properly like this! It was a zombie graveyard full of props and different backdrops, fire and smoke throughout. Giant monsters, robots and the like walking across the stage while the band played and what I can only describe as World War II looking Warhammer Space Marines shining spotlights into the crowd. They opened with ‘Jesus Frankenstein’ and powered into the classic ‘Superbeast’ and it was top stuff from there on in. Playing solo numbers like ‘Demon Speeding’, ‘Living Dead Girl’, ‘Never Gonna Stop’, ‘Sick Bubblegum’ and ‘Werewolf Women of the SS’ (Backed up by a movie trailer for the same titled film starring Nicholas Cage – funny, but a spoof I hope!). I was never happier than when they broke into the occasional White Zombie track. They did my fave ‘More Human Than Human’, ‘Supercharger Heaven’ and the classic ‘Thunderkiss 65’, which sounded really meaty! Midway through Thunderkiss, Rob Zombie did a lap of the Apollo with a torch while John 5 soloed away on stage. More lightshows, explosions, videos of naked women, zombies and the Munsters later and they ended on ‘Dragula’. I was glad I caught the show. It was a good one to see after such a long hiatus from eth UK. He’s back over for Download, but we’re only doing one festival this year, and it’s looking like Sonisphere, so I’ll miss it! Don’t leave it so long next time, eh Mr Zombie?? ?